The Vandalia Volunteer Fire Department was organized under state charter in 1889. At that time, the Fire Department had one hand engine, one hose cart, one hook and ladder and approximately 1,000 feet of fire hose. Water was drafted from private wells and cisterns until a municipal water supply was installed by the city. 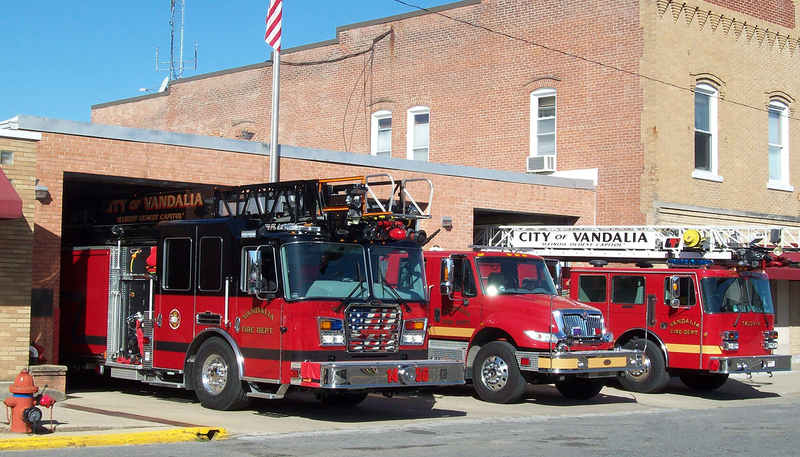 At the present time, the Vandalia Volunteer Fire Department has 23 firefighters. We operate with three engines, two aerial, one equipment squad, one light rescue squad and one brush truck. On average, we answer 100 fire calls per year which includes approximately 900 man hours fighting fires. In 2010 we had 2,000 man hours dedicated to training. Our training comes from in house as well as outside sources such as the Office of the State Fire Marshall and the Illinois Fire Service Institute. Over the past years, we have been able to lower our ISO rating from an 8 to a 5. We continue to work hard with City officials to lower that rating and provide the residents of the City of Vandalia with the best fire protection available.